Please note Seriously Pro Racing no longer manufacture this FC, so the version we sell is a ‘clone’ board. The Seriously Pro Racing F3 EVO is the latest flight controller designed specifically for Cleanflight by none other than Cleanflight’s creator, Dominic Clifton. Like the other SP flight controllers, the EVO uses the latest F3 hardware and sensors to take full advantage of Cleanflight’s impressive list of features. Within the SP product range the EVO sits under the F3 Mini, but considering the price difference there’s not a lot in it. The EVO uses the same next generation CPU and sensors as the SP Mini, so you’ll still going to get that incredible performance only delivered by an F3 flight controller. Like the SP Mini, the SP EVO also incorporates a MicroSD card socket for blackbox logging, and an IR transponder compatible with race timing systems as used at the World Drone Prix Dubai. It also boasts the same receivers compatibility, with PPM, SBUS and Spektrum DSMX supported without an inverter. Maybe its best selling point is its stackable design, which makes it plug and play with compatible OSD and PDB boards, including the new SP Racing F3 OSD/PDB. For reference, the SP Mini features an in built BEC, which the EVO does not so you will need a 5v power supply BEC for it. The Mini also features a superior dual IR LED transponder system, while the EVO uses a single IR LED, and finally the SP Mini offers slightly more versatility in terms of connections than the EVO. That said, in terms of value for money, you simply can’t beat the EVO. Mk 11 Version Updates: Slightly revised PCB for better power routing. New 2x high-current diodes instead of a single 500mAh dual diode and various other PCB changes for even better reliability. The SPRacingF3EVO has flight-controller features that make it the board of choice for any new multi-rotor build. The gyroscope and accelerometer sensors are connected to the fast SPI bus. This enables the software to get more data even quicker to help stabilize your aircraft even better. 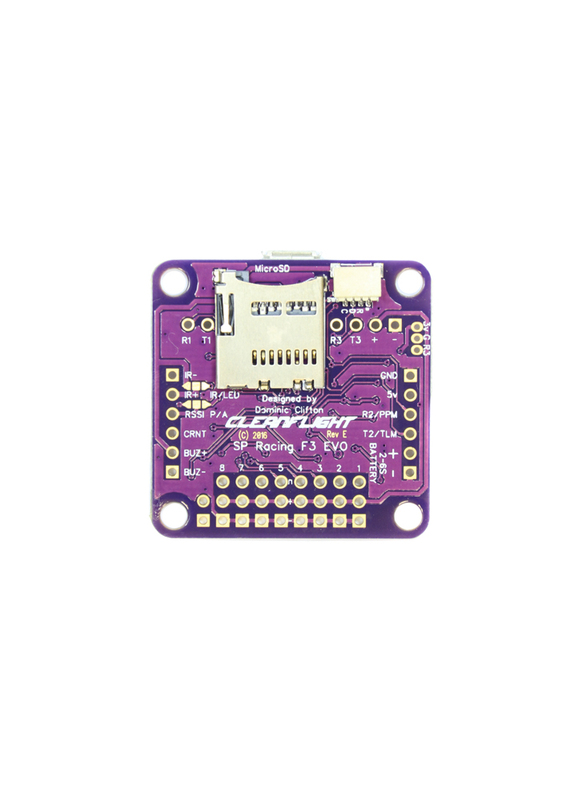 The SPRacingF3EVO is the first and only standard size board for Cleanflight that features a MicroSD card socket for logging. Supports MicroSD/SDHC up to 32GB - just leave one in and log every flight! USB socket is not shared with any of the 3 serial ports. No more unplugging your OSD when configuring. The SPRacingF3EVP is a stackable design. Connect an OSD or PDB directly under the board for a super-tidy and wire-free installation. Stackable designs are proven to be more durabel in a crash. Dedicated ports for PPM/SBus/SumH/etc for easy connections. Socket for plug and play Spektrum Satellite receiver (3.3volts). Developer friendly debugging port (SWD) and boot mode selection, unbrickable bootloader. 8 PWM output lines for ESCs and Servos. Arranged for easy wiring on standard pin headers. With a full-set of sensors (Accelerometer, Gryoscope, Compass and Barometer) each SPRacingF3EVO is capable of GPS Navigation. STM32F303 CPU, 72Mhz inc FPU, 256K Flash. Special QR-Code to download your unique transponder code. JST-ZH connector for spektrum satellite receivers.